When your children go off to school, you hope they're not being exposed to poisons in their drinking water. But, following a NewsChannel 5 investigation, Tennessee lawmakers heard Wednesday that lead could be a problem that no one's watching. "There is a significant risk of lead getting into the drinking water, is that correct?" Rep. Mike Stewart, D-Nashville, asked retired environmental regulator George Proios. Members of the House education committees heard testimony about the potential danger lurking in the drinking water of Tennessee schools. 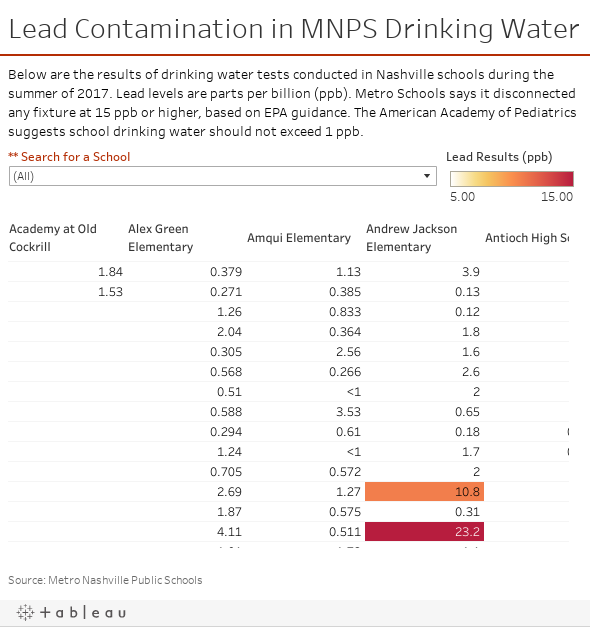 That follows a NewsChannel 5 investigation that obtained the results of tests conducted by Metro Nashville schools that discovered potentially dangerous levels of lead in some buildings. Rep. Sabi Kumar, R-Springfield, asked, "Is there an established schedule of testing or is it up to each district?" "We do not have a standard," said David Money, a regulator with the Tennessee Department of Environment and Conservation. Money admitted that the state has no idea how many school districts actually test for toxic metal. "This is a problem that you have seen in older buildings comparable to some of the schools that we have in Tennessee?" Rep. Stewart asked Proios. As the executive director of the New York State Legislative Commission on Water Resource Needs of Long Island, Proios was behind one of the first anti-lead regulations passed in the country. "Without testing, you are almost shooting in the dark," Proios testified. "You need to find out how widespread the issue is." But even when Metro Schools did find high lead levels, our investigation discovered that, in some cases, officials kept the results to themselves for months -- without doing anything about it. Rep. Jason Powell, D-Nashville, asked David Money, "If testing is found and lead is found at high levels in the schools, then schools don't necessarily have to tell parents, teachers, administrators. Is that correct?" Powell said later, "If you find lead in the drinking water, you've got to let people know." Earlier this year, Powell and Rep. Rick Staples, D-Knoxville, tried to pass legislation to require all Tennessee schools to test for lead. Now, they see new hope for their bill. "The majority of our colleagues -- both sides of the aisle -- understood how important it was to be proactive and not reactive, that we have the children in mind," Staples said. Powell added, "In addition to the testing, we are going to make sure that we tighten it up so that if there is indeed lead found in the drinking water, that parents are notified." One lawmaker questioned whether testing for lead would mean that the state would need to come up with money to rip out pipes inside school buildings across Tennessee. But Proios insisted that it's a problem that could be solved by installing water fountains with lead filters.